Yarmouth is home to 7,162 people living in southwestern Nova Scotia, and is sometimes nicknamed "The Gateway to Nova Scotia". A fast ferry called The Cat runs daily from Bar Harbor, Maine, to Yarmouth in the summertime. Yarmouth County history is illustrated through Canada's third largest ship painting collection, a costume collection, and over 20,000 artifacts at the Yarmouth County Museum. Nearby, the Pelton-Fuller House is the summer house of the original "Fuller Brush man" Alfred C. Fuller, and summer visitors can see period furniture, glassware, silver, and artworks. The history of firefighting in Nova Scotia is displayed at The Firefighters Museum of Nova Scotia which has on display antique pumpers, hose wagons, and ladder trucks. 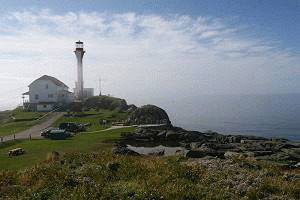 Outdoors enthusiasts will enjoy nearby beaches, several with nearby traditional lighthouses such as the Cape Forchu Lighthouse built in 1840. A few miles away, the town of Shelburne has 2,013 residents. This is down from the Spring of 1783 when 5,000 United Empire Loyalists arrived and proceeded to make Shelburne a fishing and shipbuilding centre. The Shelburne County Museum tells the story of the Shelburne Loyalists and shipbuilding in Shelburne. The Dory Shop Museum is a living tribute to the 1880 dory shop that made the small boats that were integral to the area's shipping industry. The Ross-Thomson House and Store Museum is restored to the store's 1820's glory. The Muir-Cox Shipyard from the 1820's is on display as they build wooden boats and manage a Shipbuilding Interpretive Centre. 2008 will be a festive year in Shelburne as the Loyalist Landing 2008 Society is planning a year-long series of events to celebrate the225th anniversary of the Loyalists' arrival. This three story wilderness hotel beside the Tusker and Napier rivers features two on-site restaurants serving dishes made from local seafood and ingredients. All rooms provide river and forest views. The lodge is made of handcrafted Eastern Spruce logs, granite and sandstone. All rooms include a full bathroom, handmade wooden furniture, and a TV with DVD player.